It came up in class recently that the Ancient Greeks knew the Earth was round and that in fact, Eratosthenes even measured the Earth’s radius. We can revisit his method using some fun web-based tools. If you happen to be standing on the Tropic of Cancer at noon on the day of the summer solstice, you will notice that you have no shadow. The sun is directly over your head. On that same day, if you are some distance north (or south) of the Tropic of Cancer, you WILL have a shadow. You can use your height and the length of your shadow to calculate the angle of the sun overhead. That angle is also the central angle from the center of the earth to your current location. There are 360 degrees in a full circle. And the corresponding distance is the full circumference of the Earth. I thought it might be fun to see if we can reproduce this result using some helpful sites on the web. You can see that the shadow is gone! Depending on how much you have revealed to your students, it might be helpful to note the latitude (in the window on the lower left). The next step is to choose another location north or south of our first location so that we can check out the shadow there. I went north to the little town of Olney Springs in Colorado. I chose this pretty much at random but nearly due north from Sombrerete. You can see that on the same time and date as before, the shadow of the 1-m tall object is now .26 meters. You can use the inverse tangent to get the angle of the sun. Or, if you feel lazy, you can read the angle right from the website — but that is the complement of the angle we need. Either way, you get 14.7 degrees. 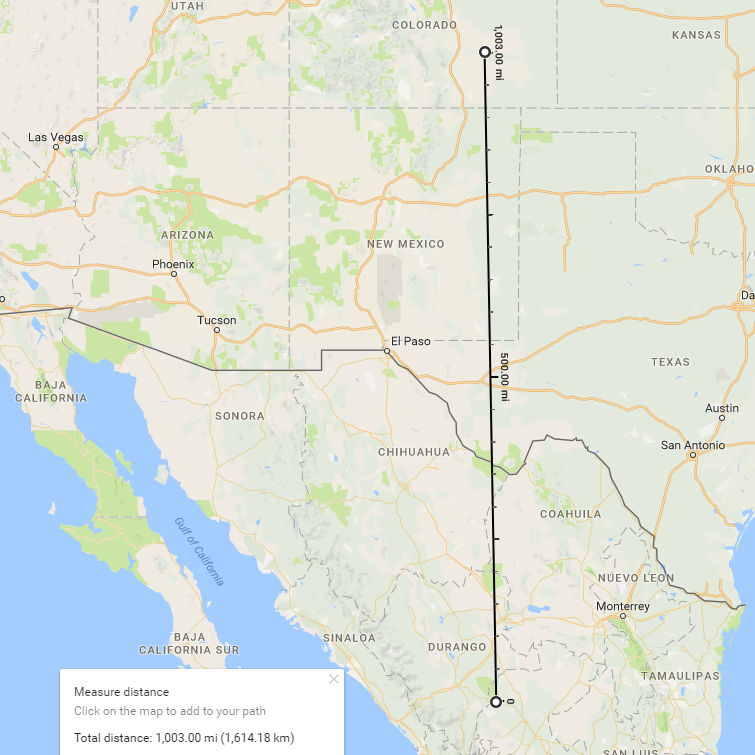 This solves to give as the circumference of the Earth: 39,526 km. 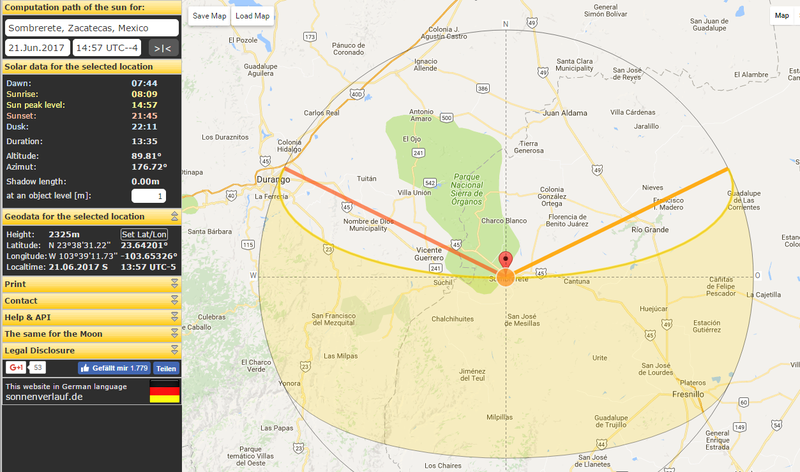 From there, we get a radius of 6,290 km — a result that is less than 2% away from the “official” value. Of course, it’s good to remind students that Eratosthenes worked this out more than two millennia ago! Back Door = make up numbers for the variables in the problem, work out an answer that is based on the numbers you made up, then put those made up numbers back into the answer choices, ruling out any that don’t produce a matching answer. Linear modeling again! When y=mx + b (or b + mx) the b is the starting value. In this case, that’s the service fee. Yes, you should be able to match a graph and its equation. But if you can’t…pick any x value,,,say x=2. Find the y-value that goes with that x value. (You get y=-1) . Then, check which graph contains the point you have just found, (2,-1). If you need to, use the back door: make up numbers, then put your numbers into the answer choices to see which one works. No real trick to this one once you understand what they are asking. In other words, when you add entry in the second column to the one in third column, do you get the value in the first column? They want you to do polynomial division. But seriously, this one cries out for the back door. Try letting x=1. Work out the answer. Then put x=1 into each answer choice. It’s much easier my way. Try numbers! I used a=1 and b=4 so I got 9. But oh, no! A and D both come out to 9. No worries – just do it again with new numbers. I tried a=1, b=6 and got 16. This time, only D worked. Other than playing around with numbers, how else are you going to do this? DITW – even I admit that algebra is the fastest way. But if you are comfortable with the idea of weighted averages and inverse proportions, there is another way to think about this one. The goal is a 15% solution. Since that is closer to the 10% stuff than it is to the 25% stuff, I expect to need less of the 25% solution than the 3 liters I already have. In fact, if you look at how far each solution is from the goa, the 10% stuff is 5% away, the 25% stuff is 10% away. Like weights balancing on a see-saw, the farther away, the greater the effect. In fact, it is an inverse proportion. So I know I’ll need half as much of the 25% solution. OK, I admit that if I were taking this test, I would never have come up with that method on time. So in this case, do the algebra if you can. If not, take a guess and move on. Combine like terms if you want. Or try a number! You are looking for shallow, then level, then steep. Slope is rate of change. Also, the snow was always getting deeper so C and D are silly. They are just checking if you know that you can divide both sides of an inequality, in this case by 3. It seems from the released tests that the SAT would really like you to know that to make accurate predictions, a survey must involve RA NDOM sampling. If this is your sixth practice test, then you have seen this before. But read carefully so you know if they are asking about everybody or just a subset. This time, they only want to know about vanilla lovers. By algebra, if x is the second voyage, then x + x + 43 = 1003. But why not just try the answer choices? You don’t have to calculate the average growth rates to see which is greatest. Average growth rates are also slopes of the segments that connect the two points. So draw them and then pick the steepest one. And here we have yet another linear model: y= mx + b but with some of the letters changed. The a value is still the rate of change, or in this case, the amount of daily growth. Pick a value from the graph or chart . For instance, on day 28 the height was 98. Try t = 28 in each answer choice. You will see that only one answer is even close. Make up a set of numbers so that 2h + d = 25. Then go to the answers…by now you should know that I call that “the back door play”. In basketball, the back door play gets you an easy layup. Once you do that, finding the median is just a matter of finding the middle number. Also, once you have done a few this way, you won’t need to any more. You can just think: there are 21 states on the list so 10 of them will be greater than or equal to the median, 10 will be less than or equal to the median and the 11th one will be the median. Start at the top of the chart and keep a running tally of how many states you have accounted for. By the fourth row, you will have counted 10 states. The median will be in the next row. You can DITW or you can use trial and error with each answer choice. Linear functions are “evenly spaced”. So to start, figure out what goes between the first row and the second row. Then you will know how much you have to go up by to get to f(3). This is yet another example where you are better off finding your own answers first and then checking which equation matches them. Just draw a number line and you can easily see that the two points they are talking about are -1 and -7. So check each answer to see which one works with both of those values. Let’s make up numbers again. For example, if t= 25, then s = 80 and the average speed is 80/25=3.2 inches per second. Now, it’s off to the answer choices! Hmm..if we drew a curve through these points it would be a downward parabola. So you know it is B or D. When x=4, it looks like y= 800 or so. Plug in x=4 into B and D. It won’t be a close call. If you don’t want to do the algebra, you can graph both functions on a graphing calculator and then trace along until you come to the intersection point. Make a little chart, fill in the 480 dollars at the bottom, then work your way back up, cutting the value in half each time. 1. While it would be best if you can immediately make the connection between an equation in slope-intercept form and its graph, you do have a backup plan here: pick some point on the graph, say (2,3) and check which answer choice fits. 2. Look at the central angle to see what fraction of the circle we are talking about. 3. If you are quick about it, factoring is fine. But trial and error with the answer choices works pretty quickly too. 8. This is an example (yet another) of y=mx+b where they want to see if you know what the y-intercept means…it’s the “starting value” or in this case, the speed at 0 degrees. 9. This LOOKS like you are going to have to do algebra – substitution and whatnot. But before you jump in and do that, it’s worth playing around with some easy numbers to see if you can find a solution that way…I won’t ruin the fun by giving away numbers that work. I’ll just say that you will be surprised to find them with ease! 10. Again, if you don’t want to do algebra, use the back door: make up a and b, calculate z, y and 4z+8y. Then go check the answers to find the match. 13. Make up numbers! Say n=5…that makes t = 7. For an additional cup, n=6 and now t=8. So one more cup meant one more tea bag. 14. You should recognize a graph of an exponential function (see page 182 ) and you should know what happens when you shift it up 1 unit (See page 129) and then what happens when you flip it vertically (see page 130). Update 3/18/17 — even if you don’t know what the graph should look like, you know that the function is f(x)=-(2^x +1). You can make up an x value and see what why value you get. So for instance, if x=0 you get y=-2. Then look at the graphs to see which one has (0,-2) as a point on the graph. 19. Well, they WANT you to put the fractions over common denominators and clean up. That will work. But there is a neat alternative: they said the expressions are equivalent for ANY value of x other than -2. So pick a lazy value! I went with x=0…a little bit of algebra (easier than what they wanted you to do) leads to a = 2. If you don’t believe me, try it yourself with some other x value. It will still lead you to a=2. 20. DITW – and I admit, I am not sure how this question is worthy of being the last one in a section. 2. Just pick a row of the chart and check which answer fits. 3. Simple ratio problem, but don’t forget the units conversion. 4. Well, the algebra is literally one step: divide both sides by 3. That’s faster than making up numbers. In fact, to make up numbers, you would probably end up doing that same algebra anyway. 6. No need to set up a system of equations! You can just try each answer one at a time. But there is also a “think-about-it” method (see page 159 ). Suppose all she bought were magazines. That would cost $11, leaving $9 unaccounted for. Novels cost $3 MORE than magazines. So how many must she have purchased? 7. No kidding, walk into the SAT knowing about models for linear growth (see pages 146-147). 9. If you are not sure how to convert the 2 kilometers back to miles, you could also use trial and error, multiplying each answer choice by 1.6 to see when you get closest to 2 miles. 12. Algebra is easiest this time: you just add the equations. The y terms drop out and you are done! 13. Trial and error! But another pro tip: check the easier inequality first. You will see that just the one inequality rules out all but one of the answer choices. 14. DITW – and if you have already worked through tests 1 – 4, this should look like a rerun. 20. An odd little question. But you can rule out A and C – they stay constant. And you can rule out B – the distance from the starting point increases steadily. 21. Just make up numbers and see what happens. But be careful to make a negative and b positive. And if you are shaky on your arithmetic with negative numbers, let your calculator take care of it. 22. DITW – but if you don’t feel like doing percents, notice that the answer choices are pretty widely spaced and that 34.6 % is a little more than a third. But they want the kids with FEWER than 2 siblings, so roughly 2/3 of the class. There are 1800 classes of that size. So you could multiply 1800 by 26 and then take 2/3 of that answer. That will give you a close enough result. (But you wouldn’t use this rough estimate if the answer choices were tightly spaced. 24. It helps if you know the quick way to find a 40% discount followed by a 20% discount: multiply by .6 and then by .8. Then you have to notice that the purchase price is the price AFTER the discounts. So to “undo” these discounts, take $140000 and divide by .6 and by .8 – or start from each answer choice and take the discounts, picking the answer that leads you to $140,000. 25. Again, if we can find the answer our own way, we can check which of their answers agrees with ours. Since 20% of 150 is 30, the first batch of people gave us 6 more than we need. So the second batch can give us 6 less than we need, which is 24. So 24 is the lower bound for p. Stick that into each answer…only d makes sense. 26. DITW, though making up a number for a might help you to see what’s going on quicker. 28. You don’t need to write equations but you do need to understand slopes. The function f has slope = ½ (as you can see directly from the graph) so the function g has slope = ½ × 4 = 2. You have been given the point (0,-4). You could actually draw a picture, neatly counting as you rise 2, run 1 all the way to (9, 14). Or you could notice that rise = slope times run so you have to rise 18 units. Starting from y=-4, that takes you to y=14. 30. You can think of this as the difference of two squares and then factor it. But you can also just make up numbers for x and a, calculate y and then go check each answer choice. In other words, this is another classic back door problem. 31. DITW – it’s a classic ratio problem. 34. Another “Case of the Missing Constant (see page 126). They tell us that (2,5) is a point on the graph. That means that when you use 2 as the x-value, the function output is a 5…. 35. Jump in and play with numbers. Make the length 5 more than the width and keep trying until you find a pair that multiplies out to 104…it won’t take long. 36. This is a very old trick that still shows up on the SAT. Draw the segment from A to P. You have just made two little triangles, each of which is ISOCELES. How do we know that? It’s because P is the center of the circle! All of the radii are equal. From there, finding the angles is much easier. 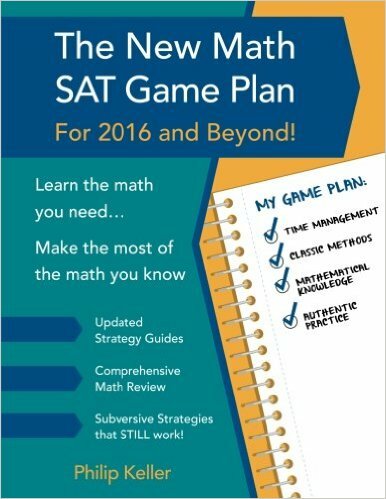 This is one of the “Attitude Adjustments” in The New Math SAT Game Plan: For 2016 and Beyond! The SAT, and really the entire college application process, is notoriously stressful. You may have already noticed this. And it may be that your parents are adding to your stress, not quite able to maintain their cool as they guide, cajole, push and pull you, trying to help you navigate these waters. I am well-known for being a calm voice of reason (with other people’s children) but as a parent, I can tell you it is hard for us too. We are eager to see you succeed and we are older than you. With our advanced years and wisdom, we can see some of the challenges that lie ahead with a clarity we are convinced that you lack, but we have less control of the situation than you do. So we feel, and attempt to communicate, a sense of urgency. Different parents deal with this stress in different ways. The author and parent, Debbie Stier decided to immerse herself in the SAT experience. Over a period of a year, she tried a variety of prep methods and then took the SAT every time it was offered. She then wrote a book about it: The Perfect Score Project. Though I never actually worked with Debbie, she did interview me, and my book was one of her resources. She improved spectacularly in reading and writing and helped her own kids to great success. But her math improvement was actually quite small. When her project was finished, we emailed about what she could have done differently. I’m going to tell you what I told her: the goal of “perfection” got in her way – and lowered her score! I am not telling you to abandon that goal. I have not met you! If you are already scoring in the high 600s – low 700s and you have just begun to prepare, well then maybe a perfect 800 is in your future. But for most students, obsessing over perfection makes it harder to achieve their personal best. Look at your PSAT score or your last SAT score. Ask yourself: how you would feel about raising that math score to the next level? Let’s start by turning a 440 into a 570. A 540 into a 650 or even a 700. Take that 650 and turn it into a 720. I’m not asking you to give up on long-term dreams, but let’s start by making incremental progress. I am telling you that you are more likely to raise your score on the very next SAT you take if you approach it in a slower, more low-key and playful way. You need to give yourself time to think and time to breathe. So when I recommend that most of you take the SAT with a strategy that causes you to run out of time, please be open-minded. If you do this, you probably will NOT get a perfect score. That’s OK. It’s also the single easiest thing you can do to raise your score to your own personal best. And if when you walk away from this test (and this whole college application process), you have achieved your personal best, isn’t that the perfect score? Since it does not look like I will be learning to write my own applets any time soon (or getting any papers graded!) I have continued using the Interactive Physics work-around to generate a gallery of these polar graphs. If you are learning (or teaching) graphing in polar coordinates, I hope you find these helpful. NOTE: I am not claiming that these are the fastest ways to get these graphs. There are many graphing programs that can sketch these diagrams more quickly. But I think these might help you to build an intuitive understanding of why the graphs come out the way they do. Reminder: I am using Anton’s idea about an ant that walks along a rotating clock arm. The ant’s position along the clock arm is give by the polar function r=f(θ). These animations show how the polar curve is constructed as the ant’s position changes while the clock arm rotates. Anyway, here they are. Click on a video to play it. And it’s easier to see what’s happening if you expand the video to full-screen mode. ANOTHER ROSE PETAL with 3 loops — what’s different about it? OK, that’s all for now. If you had another one of these that you were eager to see, post a comment and I’ll try to add the one you want to the gallery. 1. Try x=0 and see what happens. 2. This is a Case of the Missing Constant. See page 126. 3. Let’s use trial and error: if y=2 then x has to be 12. Put them into the second equation and see what happens. 4. Classic back door – make up a number for x…I used x=2. So -3x = -6 and f(-6)=17. Now put x=2 into each answer choice. 5. Another back door. Try x=0…see what you get and see which answers match. Then try x=1…it’s magic. 9. Use trial and error to show that 6 works and 3 does not. 10. Hmm…if your arithmetic is good enough, you can use trial and error. But otherwise, go ahead and DITW. 11. One way to avoid the algebra this time is to make a really neat graph. You have to solve the first equation for y and you do have to know one of the ways for finding the vertex of a parabola. But your reward is that you can look at your picture and see that the line crosses the parabola twice. You may think that my way is no fun. Look at their way too and see what you prefer. 14. DITW – across the country, students are now going to be really motivated to learn how to divide complex numbers! 15. You can back door this one too! Make up a k and a p…then you can use the quadratic formula or you can complete the square. But it’s easier with concrete numbers. 17. You can make up numbers for the lengths of the triangle. But the sine of x has to be .6. So I used 6 for the vertical leg, 10 for the hypotenuse. Then, Pythagoras says the horizontal leg is 8 – it’s a 6-8-10 right triangle. But that makes the cosine of y 6/10 or .6 as well. THEY REALLY WANT YOU TO KNOW THE COMPLEMENT RULE FOR SINES AND COSINES! (x2 + 2)(x – 5)=0. The solution is x=5. Then you can see that in 3 10-kilometer jumps, the temperature went down by 75 degrees so it must be 25 degrees per 10-kilometer jump. 1. Well, this is easy either way, but you COULD use trial and error if you felt like it. 2. And this could be done by the back door. But it is quicker if you recognize y = b +mx when you see it. 4. First of all, this is a probability scale-up. And second of all, you should notice that the percentage is close to 25% or ¼. Only one answer choice is in the neighborhood of ¼ of 225. 6. Algebra, trial and error or just play around with numbers until you find a pair where one is 11 more than the other and they add up to 59. 8. Draw it! You will see that the only way to avoid quadrant I is to slope down hill. 11. You don’t actually have to calculate the ratios or even estimate them. The ratio is also the rise over run, starting from the origin. So imagine lines (or actually draw them if you like) starting from the origin and going to each of the four labeled points. Pick the line with the steepest slope. 13. Classic example of exponential growth: population increases by the same factor (x10 in this case) in equal time increments (5 years in this case). 15. Exponential decay is one of the graphs you want to recognize just by looking at it. (Exponential growth is another. See #20 below) See pages 181-188. 16. To start, this is yet another example where the key is to understand the form y = b + mx. In this case, the b (or starting amount) is the material cost and the m is the rate of change. But as the given formula tells you, you have to add the two daily rental costs to get that rate of change. So at store A you get y = 750 + 80x and at store B you gety = 600 + 105x. But then what? You could set up and solve an inequality (DITW) or you can just try numbers. If you try x = 7 you will see that it is already too many days. 17. See above – the slope is the daily cost. 19. Trial and error: choice A works. Choice B doesn’t. So A is the smallest…but you can also do some very quick algebra. Remember that you don’t have to solve for the variable. As the official key does point out, you can just add 4 to both sides. 23. You are not expected to know how to calculate standard deviation. They just want you to eyeball the data and notice that for City A, the data is clustered closer to the mean and for City B there are more data points out on the margins. Then look at those numbers: if you triple the second one and add it to the first one, you get zero! 26. Make up numbers and draw it on a number line. You will see that y has to be bigger than x but that x can be positive or negative…it just has to stay between y and –y. 27. DITW – and it’s y = b + mx again! 28. While foiling is easy and completing the square is fun, you do have another option: graph the given function on your calculator and then use your calculator to find the minimum value – you should get -25. That only appears in choice D. But wait – if they had been nastier, they could have had two answers with -25 in them but one of them not even the right parabola! If that happens, just graph the answer choices as well to see which one gives the same graph as the original function. But like I said…foiling is easy and completing the square is fun. 29. A classic back door! Make up a value for m, work out the answer, plug your m-value back into the answer choices. 30. This one is supposed to be hard. But I think the hardest part is figuring out what they are asking you! Try reading it one more time…ok, now I will translate. The question is essentially asking this: At what y-value can we draw a horizontal line that will cross this graph three times? 31. DITW – and note: you can think of this one as y = b + mx too. 32. Make up an x, use it to find P. Add 1 to your x, find P again. You will see that P goes up by ½ or .5. Or re-write the equation as P =(1/2) x + 110. Then you know that 110 is the starting value and ½ is the rate of change. 34. If 3/5 of the bats are male, then 2/5 are female. So the male: female ration is 3:2. And we have 260 female bats. Set up the proportion, cross multiply and divide and you will see that we need 390 male bats…but we already have 240, so subtract to get 150. 35. Make up numbers for n and v. Calculate q. Then multiply to get 1.5v and recalculate q. No matter what numbers you make up, the ratio of your new q to your old q will be 2.25. 36. The full circumference is 20pi. You have to multiply that by the fraction x/360 and have the answer come out between 5 and 6. Why not use trial and error? 37. The quick way to find a 28 percent decrease (see page 74) is to multiply by .72. And this time, we found alternative solutions to about 40 out of the 58! 4. This is supposed to be easy algebra, but in fact it is also easy to mess up! So before you do algebra, read and think: 30 is twice as big as a number, x. So x is 15. And now that you know the value of x, checking to see which equation has it right is pretty straight-forward. 5. Their way: cross multiply, distribute, solve for x, divide by 5. But you can also do this by trial and error. For example, if the answer is A then 10 is x/5. So x would have to be 50. Put 50 into the original equation and you see it does not work. So A is wrong. Eventually, you will try C: x/5=2 and that makes x=10. And if you put x=10 into the original equation, it does work! 7. DITW – This is a very basic application of the remainder theorem, disguised in chart form. If f(4) = 0, then x-4 is a factor. See page 227 for more detail. Quickest: apply the slope formula to the points (c,d) and (0,4). Back door: make up a k-value to get a line. I used y=3x+4. Draw a neat graph to find a point on that line. Starting from (0,4) I went over 1 and up 3 to get to (1,7). Use those coordinates as your c and d values, plugging into each answer choice to see which one matches your line’s slope. 9. If the coefficients have the same ratio, then the lines are parallel (or they are the same line). So set up the proportion k/4=3/5, cross multiply and divide. 11. You might discover the relationships more quickly if you make up numbers that fit. And if it goes wrong on your first try, just try again – you will be solving the problem. As you fiddle around with the numbers, eventually you discover that x, z, w and t all have to be the same. And y and u have to be the same as each other but they don’t have to be the same as the others. 13. You can DITW. But you can also just let x=1and see what you get. I think the equation you land on is not that bad, but if you don’t want to solve it, you can try the answer choices and see which one works. Be lazy…try 3…nope… -3…yep! 14. DITW or complete the square. 15. While you COULD use made up numbers, with no calculator you are probably better off DITW. 16. This is a clever little problem. They could have made it a lot harder than they did…before wading in to the factoring needed, why not play with some numbers? Try x = 1. It probably won’t work because there is no way they would make it that easy – oh, wait. It worked. Never mind. Oh and look at that: 2 works as well. How about that. 17. DITW – and yes, start by clearing the fractions. 19. This is a classic two-variable word problem. So you can DITW if you are comfortable. But as we discussed (pages 156-158) there are always alternatives. If you are patient, you can use trial and error even here in a grid-in section. For example, say the burgers have 600 calories each. Then the fries have 550 each. In that case, 2 burgers and 3 fries have 600 + 600 + 550 + 550 + 550 = 2850 calories. That’s too high. Lower your guess and repeat. I know this takes a while, but if you don’t know the algebra, this is one way around it. But as I have mentioned, you can often think your way out of these. The burgers have 50 more calories than the fries. So if we replace the 2 burgers with 2 orders of fries, that means the 5 orders of fries will have 1600 calories. (That’s the original 1700 minus the 100 we saved by replacing burgers with fries.) Now we know that each order of fries must have 1600/5=320 calories. And the burgers have 50 more = 370. 20. I’m still hungry from solving the last problem. So for this one, DITW. 4. Pick an input n-value…say 3. When you plug it into the function, you are supposed to get 4 as your answer. Check the answer choices to find the one that works. If more than one of them work, check another input-output pair. 6. No doubt, you could add these and combine the terms. That’s probably best. But you could also use the back door…make up an x value, work out the two expressions, add them. Then put your x-value into the answer choices. I’m just saying that would work too. 10. DITW – and don’t worry if you have not had physics yet. All of the information you need is right there in the problem. 13. Again, don’t be intimidated by the physics. This is a classic back door problem. Make up t, v and k, then calculate h. Then stick h, k and t back into your answer choices to see which one gives you the matching v-value. 16. DITW, but they say it in a more complicated way than we need: you are just looking for the point on the x-axis where the f- function and the g-function add up to zero. So one of them will be above the axis and the other will below the axis by the same distance. That happens at x= -2. 17. You can look at the supply equation and ask yourself what happens if p increases by 10. Or you can actually try it: make up a P value. I’ll try P=20. I get S(P)=(1/2)×20+40=50. Now increase the P value by 10 to P=30. S(P)=(1/2)×30+40=55. So now we know what happens when P increases by 10. 18. Trial and error –take an answer, put it into both the supply equation and the demand equation. If the two equations give the same result, you’ve found the answer. 21. This is just asking if you know what it means to compound interest and that this leads to exponential growth. Review pages 181-188. 22. OK, I admit that I used algebra on this one — but less messy algebra than their way. I let 2y be the sum of the other two numbers. That may seem like an odd choice, but 50% more than 2y is 3y. So now the sum, 5y=855. Divide by 5 to get y=171. And 3y=513. Also, you could do this by trial and error, but it isn’t really easier that way. 23. Remember, after SOHCAHTOA, it seems that the most important trig fact is the rule about sines and cosines of complementary angles. Saying that sin(a)=cos(b) is another way of telling you that a and b add up to 90 degrees. If you realize that, you can find k either by algebra or by trying their answers one at a time. But wait! Even if you don’t know any of this…you can try each of k-values in the answer choices to find the a-value and the b-value and then just use your calculator to check if sin(a)=cos(b)! 24. They intend for you to set up and solve equations. But trial and error works too. For example, if there are 16 students: 3×16=48…and 48 + the 5 leftover = 53 milliliters. Then, 53 + 21 = 74. But 74 divided by 4 is not 16. So move on to another answer choice until you find the one that works. 26. You can use trial and error to make sure you get the same slope going from the origin to each of the two given points. But really, as long as you are doing trial and error, why not just draw a neat diagram? The one where all three points line up on the same line will be obvious. 27. Make up dimensions for the rectangle. 10 x 10 is a lazy choice… Then, increase the length by 10% to get 11. Try decreasing the width by the percent given in each answer choice. If the area of the resulting rectangle is 12% less than the rectangle you started with, you have found your winner. Note: the advantage of choosing initial values that give an area of 100 is that it makes it easier to recognize when the area has dropped 12% — the new area will be 88. 28. While it would be great if you just looked at this and recognized the correct expression for exponential decay, you can also use the back door. Say we let t = 20. The population will drop 10 percent from that original 50,000 to 45,000. And when you put t=20 into each answer, only one comes out to 45,000. You could do trial and error, playing with numbers that add up to 18. Multiply the females by 5 and the males by 9. If the numbers you get add up to 122, you are all set. Then there is that think-about it approach. Suppose the group was all female. There would be 18 female lefties and 18×5=90 righties. But we are supposed to have 122 righties. We are missing 32. So we need to replace some of the female lefties with male lefties. Since there are 9 times as many male righties as lefties (instead of 5 times as many) every time we replace a female with a male, we gain 4 more righties. So to make up that deficit of 32, we replace 8 female lefties with male lefties, leaving 10 female. 10×5 = 50, 8×9=72 and 50 + 72 = 122. I know this method is tricky. You would have to practice it to do it with confidence. But it DOES work! And if you work through all of the released practice tests, you will certainly find plenty of chances to practice. 31. Just play with numbers: $3 + 2 times however many student tickets must be at least $11 and not more than $14. Try numbers until you find one that works. 34. In the “Advanced Basics” section (page 207) I told you that the harder material would have easier questions. This one is asking you if you know that a full circle is 2pi radians. You find the fraction we are talking about by dividing: (5pi/4)/(2pi) and you get 5/8 or .625. 36. DITW – or graph the boundary lines on your calculator and then trace along to find the y-value where the lines meet. 37. DITW – But once again, stay calm and read. You are not supposed to already know this law. OK, this time we were able to find alternative solutions to about 29 out of the 58 problems. 1. Yes, this is easy algebra. But even here, there is a minor shortcut: as you do your algebraic manipulations, keep in mind what they ask you to find. There is no reason to solve all the way for x here. After you subtract 6 from both sides, double both sides and then add 3. Or, starting from the beginning, you could double both sides of the equation and then subtract 9! 2. Trial and error. In fact, the first equation alone quickly lets you narrow down the options to B and C. B is the one that also works in the second equation. 4. A back door gift! In fact, try easy numbers: Say a=1, b=0…that alone does the trick. 6. Just know that slope = rise over run and then you can count boxes. The line on the left rises 2 and runs 5. Since the line on the right rises 4 it must run 10. Or do trial and error. 8. Trial and error – but start with D because you are looking for the largest possible answer. D does not work – it makes the angle 45 degrees. But C works. 9. DITW – although you CAN avoid all of that with a really neat diagram. Try making your own graph. Draw it as carefully as you can. You will see that the intersection point has to be in the neighborhood of (-1, 4). 11. DITW — and review pages 221-222. 14. Review percents and exponential decay (page 181) – then this is as straightforward as it can be. 15. Another classic back door: I used x=2, got 8/5 or 1.6…went to the answers…only D matched. 16. You just need to play around until you find one allowable combination. If you notice that $250 + $750 = $1000, you can quickly see that 3 of each type is one possibility. And one possibility is all you need. 17. The school way might be quickest here: distribute everything and group the terms, noting that you only care about the “linear” or “x” terms, not the constant term and not the x2 term. But still, this is DITW. 18. This shape again! You really need to immediately recognize that this is a pair of similar triangles. And the little one on top has lengths that are half of the corresponding lengths on the big triangle below. 19. DITW – but read up on radians (page 215). This is basically asking if you can recognize a 30-60-90 triangle and then convert the 30 degrees to radians. 20. When the lines have the same slope, there will be either no solutions or an infinite number of them (if they are actually the same line). 12 is 1/5 of 60 so a=2/5 and b=8/5 but their ratio is 2/8. 1. You probably can do this by looking and thinking, but if you don’t see it, this is also a back door problem. 2. While this is a classic ratio problem, it can also be thought of as a probability scale-up problem. The probability of a bulb being inspected is 7/400. Then multiply that by the bigger sample size (20,000). 3. Trial and error works here if you don’t see the algebra. 4. I was going to say DITW – but their solution makes this harder than it needs to be. They told you that this is a direct proportion. So set up a proportion: 8/$120=20/x, cross multiply and divide. 7. The school way is to factor. But if you have a graphing calculator, you can graph it and see that the x-intercepts are at 2 and 4. 10. No tricks — just a function question. Review pages 121-134 as needed. They are asking you to find the output g(3) and then use that as the input to the function. 11. DITW – but stay calm and don’t get distracted by irrelevant info. All that matters is the number of words, how many he can read per minute and the hours he will read each day. 12. Once again, this is a linear rate of change – so it’s b + mx…only this time they are using the letter y to represent the passing time instead of the final amount. This is a common way that the SAT likes to mess with you – using a different letter than the one you are used to. 14. They just want to see if you can read the graph! Start on the y-axis, go over to the graph and then down to the x-axis. 16. This is just like our problem about bus-riders and kids who stay late (page 199). It is 7/25 and not 7/200 – we are only talking about the students who DID pass the exam. 17. Do not get distracted by chemistry. Seriously, all they are asking is can you find a number that is 20% less than 40. The quick way: 40×.8=32. 19. Median is middle number. And there are 600 students total. The median is the average of the 300th and 301st kid – but we won’t have to do that. Here’s why: starting with the top row of the data, 120 + 140 = 260. Next row: 80 + 110 = 190. And the running total is now 260 + 190 = 450. So somewhere in that second row, we went past that 300th and 301st kid! 20. This is another probability scale-up. Both schools have the same probability of 4 siblings: 10/300 or 1/30. But now you have to multiply by the size of the full population at each school. When you do that, you get 30 more kids at Washington. 21. A back door question. Try x = 150 and y = 155. It’s magic. 22. Yes, the fastest way to do this is to do the algebra. But once again, if that gives you trouble, the back door is open. Make up a P and and r, use your calculator to find I. Then put all of those numbers into each answer choice and rule out anything that doesn’t come out right. More magic. 23. I make my physics students do this kind of thing all the time. Look at the equation and ask yourself: what happens when we change the value of r? Since r is in the denominator, making r bigger makes the result smaller. And since r gets squared, whatever you do to r also gets squared. Now look at what they told you: observer A measured 16 times as much intensity. They used 16 there for a reason: 16 is 42. It must be that B is 4 times further away than A. So A is ¼ as far away as B. I know that this takes thinking and concentration, but it is easier than their way. Wait! Still not convinced? You can also do this one by trial and error. But you have to be brave about making up numbers. Make up a P value. Then make up a distance for B. Then, to try answer choice A, make up the distance for A ¼ of what you made up for B. Plug them both into the formula and see if Observer A’s intensity comes out 16 times as big as B’s. If it does, you are done. If not, try another answer. But it does. 24. DITW – review page 168 for help with completing the squares. 25. Another back door! Just make up numbers so that a + b = 0 and then plot the points neatly on a graph. You will see a positive slope every time. 26. DITW – but really, all they are asking is do you know how to read a graph! Review pages 127-128 if you are shaky. 27. Just checking if you know that rate of change is also slope! 28. This is MUCH less work than you might think! The line they are asking for is downhill and steeper than 45 degrees. So of -3 and -1/3, the slope has to be -3. That narrows it down to A and B. But we also know that the line has a positive y-intercept. So much for A. It’s B. 29. While this one does have a clever, “math-y” solution, there are two less-clever solutions available. You can set ax2+b=3 and then use trial and error. You put in their a and b values and see if you get a positive value for x2. Or, you can use your graphing calculator! Graph y=3and y=ax2+b using their a and b values one at a time. If the graphs intersect at two points, you are done. 31. I know there is an easier way, but for some students, trial and error is actually better. Try 10 years…you get 15 feet. Too small. Try 20 years. You get 30 feet. Too big. 15 years? 22.5 feet…getting close now…14 years? And we have a winner. 32. Again, if you need it, trial and error will work. 33. This is a perfect example of “The Case of the Missing Constant” (see page 126). 34. Use algebra if you like, but this time even the most devoted algebra students have to admit that playing with numbers is faster. You just need two numbers that add up to 250 and one is 40 more than the other. How about 150 and 100. Ooooh that’s almost it. OK, 145 and 105? Done. 35. And now we have yet another example of y = b + mx, dressed up in different letters. Jane must have started with $15 and must be depositing $18 per week. 37. DITW – but while this is certainly hard (and look where we are in the section!) it may be easier if you think of this as a function problem. They want you to find next year’s population as the output when you know this year’s population as the input. Then, to answer their question, you have to take the output from after one year and use it again as the input to find the next year after that one. Once again, around 36 of the 58 had some alternate path available. 4. Recognize that this is y = b + mx…the b is the starting value. 6. Either recognize that y = b + mx, and m is the rate of change…or to see how much the boy grows each year, just make up a number for a, plug it in and then plug in a second number, one year older. For example, try a=10 and then a=11. The difference is how much he grew in a year. 8. If you see the algebra, it’s quick. But making up numbers is even quicker. I used a=4, and b=2…but any numbers that fit will do. 9. Use trial and error! But be lazy: check the easier equation first. Only one choice works. 10. This is an example of “the case of the missing constant” (see page 126). But if you do notice that the function is an even function, you can go right to the answer: g(4) = g(-4) = 8. So “their” way is quicker but requires more insight. 12. Draw a neat diagram with a line through the origin that rises one and runs seven. It will be obvious that only one of the given answers could possibly lie on that line. 13. This is a gift to students who know the back door! Say x = 6…work out the fraction, common denominator and all that…then put x = 6 into each answer. 14. Faster if you know the laws of exponents. But if you are shaky…back door! I tried x=4, y=0. Took a little while to show that 212 = 84, but it works. 15. This is a tricky one whether you DITW or mine…First notice that if you start to foil out the expression, you find that ab=15. And they gave you a + b = 8. You could solve that system algebraically, but I prefer to look at the equations and try to make up numbers. Seriously, the first numbers I tried were 5 and 3! (It can be a=5, b=3 or the other way around.) If you put a=5 and b=3 into the original expression and then go ahead and foil it all the way, you get 41. You don’t need the other possible value to know that the answer is D.
2. Like a “missing constant” problem, you could plug in their values for x and y, solve for k and then plug in the new x value. Or you could recognize that if y=kx, then x and y are directly proportional – set up ratios, cross multiply and divide. 4. Algebra is quick here, but this can also be solved with trial and error: Be lazy though – start with the choices that are easily divisible by 8. D does not work, but check out C: If 8x = 16, then x = 2…and 16 + 4x comes out to 24 which is 10 more than 14. How about that. 5. DITW – what else could it be? There is only one data set with a clear downward trend. 7. This is not really algebra. Just add up the heights of the bars on the graph. It adds up to 27.5. But they tell you that the total is actually 27,500. So the numbers on the side of the graph must be “thousands.” The “official” solution says the exact same thing but makes it look more algebraic. 8. You can do this by trial and error: carefully try 0, 1 and 2. None of them work. So it has to be D. You can also do this by thinking: the smallest value you can have for the part of the expression with absolute value bars is zero. Then they add 1 to that value. So it can never add up to zero. 9. Back door! Say t = 10 Plug in and get a=1062.8. Put that into each answer – only A comes out to 10. 12. Really helps if you just list out all of the data: 3,3,5,5,5,5,6,7,7,9,9,9 – now finding the average is just a matter of adding them up and then dividing. And by the way, had they asked for the median, a list like this would make that very easy too. 16. …and the equation is still y = starting amount + slope × run. That the slope is 3 can be determined just by counting rise over run on the graph. But don’t just count boxes – look at the scale of the graph! Otherwise, you get ¾ which is wrong. 17. They are just asking you to find the INPUT (x-value) that gives the lowest OUTPUT (y-value). 19. Yes, you could do algebra here. Trial and Error also works: for example, if they sold 77 salads, that would be 77 × $6.50 = $500.50. So they would need to take in another $336 from drinks. At $2 each, that means 168 drinks. But 168 + 77 is more than the 209 items they sold. Now you try it with choice B. You are in for a happy surprise. 20. Classic back door. And like most back door problems involving percents, it’s a good choice to make the starting value $100…The 20% discount knocks the price down to $80. With 8% sales tax, what you pay is p = $86.40. Put that value into each answer choice…wait for the magic. 23. DITW – annoying and kind of tedious, but what are you gonna do? Read the chart, find the ratios, pick the one closest to human resources. 24. OK, this one makes me laugh. You are supposed to use the center and endpoint of the radius to find the length of the radius and then write the equation of the circle in standard form. But there is a lazy work-around: that endpoint they give you does have to be a point on the circle. So you can just put that point’s x and y values into the equations given in each answer choice. Only one choice works. 26. If you don’t want to do the algebra, go to each answer choice, find 20% and add it on. When you get to choice B, you will see that you end up with the correct number of pears. 29. DITW – but review the section on the remainder theorem (page 227). 30. Well, in theory you are supposed to complete the square. But look at the graph: the vertex is clearly in the neighborhood of (1,-16) and there is only one answer choice where both of those appear directly as constants. 31. Just pick a number between 12 and 18 – let’s say he does 15 per hour. Divide 72 by 15 and move on. 36. You are looking for the value that makes the denominator zero. This is one of those questions where you can make use of your calculator. If you have a TI89, just set the denominator to zero and use the F2 command to solve that equation. Or with any graphing calculator at all, graph the equation and then trace along the graph to find where the function equals zero. If you decide to do this one by algebra, a neat trick is to replace x-5 with a new variable, say m. If you do this, you get an expression that is easy to factor. But remember to go back and solve for x. 37. Review page 74 to see the quick way to calculate percent changes: the base in that expression is 1.02 – that gives you a 2% increase each year. 38. Review percents and exponential growth (page 181). Then you will see that all you need here is to calculate (100)(1.02)10 and 100(1.025)10 and then subtract. OK, that’s all for the first practice test. If you are keeping score, I believe that for 36 out of the 58 problems, there was an alternative method available. Imagine a clock with one hand that rotates around, connected to the x-y plane at the origin. Then, imagine an ant (Anton’s Ant!) walking along that clock hand as it rotates. The ant’s distance from the origin is given by the function r=f(θ). As the clock arm rotates, the ant moves in an out along the arm. The location of the ant traces out the graph of the polar function r=f(θ). And note that if the radius is negative, that just means that the ant has walked “the other way” along the clock arm. If you do happen to have the Interactive Physics software package and would like the source files for these demos, post a comment or send me an email. That way, you can run these yourself on your own computer, changing the parameters to make discoveries. Or just leave them to run for as long as you feel like. They are very soothing to watch.